We're Spicing Up The City With The Bronx Hot Sauce! This is a momentous year for GrowNYC. Our gardens have released their very own product, aptly named "The Bronx Hot Sauce," which hit shelves late last month. The fiery green condiment was concocted by acclaimed chef King Phojanakong, a native of the borough - just like the serrano peppers the sauce is made of. Packaged by Farm to Table Co-Packers and wrapped in a sticker designed by John Jaxheimer, the sauce is the result of GrowNYC's collaboration with Small Axe Peppers, who donated 3,500 pepper seedlings earlier this year, and R&R Produce Farms, who augmented the supply for peppers needed for the first production of the hot sauce. R&R Produce Farms happens to be one of our FARMroots program's most notable success stories (the program provides training and support for recent immigrants looking to farm in the Northeast). With the fiery contents of this five ounce glass bottle, the Bronx officially asserts itself as the next big culinary destination for local food in the five boroughs. 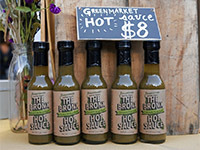 "I'm thrilled to see our developers and community gardens join together on this wonderful venture," said Bronx Borough President Ruben Diaz Jr. "The Bronx has an amazing food culture, and 'The Bronx Greenmarket Hot Sauce' will only add to the great flavors our borough produces each and every day. GrowNYC and Small Axe Peppers have developed a product that not only tastes great, but also supports our local community gardens. That's a 'win-win' for our borough, and I hope epicureans from all over the region enjoy our borough's latest food creation." Hooray for the Bronx! Moreover, the funds from The Bronx Hot Sauce sales will go right back to maintaining and developing our local gardens - in one delicious, sustainable cycle. We are proud of our gardens and everyone who has worked hard to make this product a reality. "GrowNYC's Greenmarkets have always been the best source for locally grown food fresh from the farm," says our Executive Director Marcel Van Ooyen. "Now, through this partnership with Small Axe Peppers, we are furthering our support of local farmers by purchasing their products and turning them into a delicious hot sauce that can be enjoyed by all New Yorkers." See where you can buy the hot sauce at BronxHotSauce.com. Check out The Bronx Hot Sauce in the press: The New York Daily News and The Wall Street Journal. Read more about We're Spicing Up The City With The Bronx Hot Sauce! At the end of last month, during the busy season at Youthmarket, we visited our Lower East Side Youthmarket which is in partnership with Henry Street Settlement, whose mission is to ”open doors of opportunity for Lower East Side residents and other New Yorkers through social services, arts and health care programs.” This market is open on Thursdays through November 21st, from 1:00 pm to 7:00 pm. What is Youthmarket? It is a network of urban farm stands operated by neighborhood youth, supplied by local farmers and designed to bring fresh fruits and vegetables to communities throughout New York City. Youthmarket offers families in NYC increased access to farm fresh food, youth in these areas earn money and learn small-business skills, and farmers in the New York City region continually achieve higher revenue through access to under-served markets. It was a hot, sunny Thursday afternoon, the type that makes you slow and lethargic, with the heat like an inescapably stifling blanket. But as we approached the Lower East Side Youthmarket on Grand Street, there was no sign that the summer’s worst had done its work. There was a flurry of activity. Everywhere else along the block it was empty and quiet, but the farm stand was a hub of lively chatter and busy hands. We found Phylisha Conyers busily stringing together small cards with vegetable names written on them, to be used as signs indicating the type and cost of produce displayed. She agreed to a quick interview while her hands continued to be productive, without missing a beat. How did you get involved with GrowNYC's Youthmarket? I heard about the Youthmarket program from one of my Project RISE supervisors at the Henry Street Settlement. I am working towards getting my diploma there. When I heard about Youthmarket, I thought: “Okay that seems interesting!” I mean this is something I've never done before and I wanted the experience. I tried it out with my sister, Tiana Conyers, who’s in the same program with me. We went to orientation, which was about 9 hours long, but really interesting. So I agreed to join. I’ve been here since July 10th of this year. It’s been really cool. In the beginning it was a bit overwhelming. When we began set up, there were so many people lined up already - we hadn’t even started yet! But I figured it out and learned a lot along the way, so the customers are always taken care of. The market is open every Thursday, so you’ll find me here! What is your favorite item on sale here today? I would have to say…the plums and the kale. The plums are so sweet. (Phylisha's sister, Tiana Conyers, chimes in) Tiana: Say the peaches. They’re better. Phylisha: I like the plums the best. As for kale, we never tried it before working here, but we recently tried juicing it and it was so good. Tiana: Also, the corn here is so different from regular supermarket corn. Frozen corn is like dead corn compared to this! One other thing I learned is about carrot tops: you should use them. People often throw them away but I learned we can make delicious pesto with it. We cook together every week. I believe we’re doing collard greens today. In your spare time, what hobbies do you have? Right now I’m really interested in photography. It would be cool to become a photographer someday. Aside from photography, I also love make-up. I do that for fun, to be creative. What do you believe is the importance of what you do here? Reaching out to the community, to people who are struggling, to those who don’t have access to things others do - I feel it’s so good to help them. People come here and buy their food every week, and it’s so good to serve them here on a regular basis. We have friendly customers and I love seeing them. The Lower East Side Youthmarket is located on Grand Street between Pitt and Willett Streets, Manhattan. It is in operation every Thursday through November 21st, from 1:00 p.m. to 7:00 p.m.
Big Apple Crunch Returns October 24th! We’re a month away from the 2014 Big Apple Crunch, and more than 11,000 individuals have already registered to Crunch on October 24. We’re happy to say the Crunch has expanded all the way to Temple, Texas this year! In anticipation, groups are sharing their photos of apples and tagging #BigAppleCrunch. Find A Crunch: There are Crunches happening all over the city. Eight of our Greenmarkets and Youthmarkets will be hosting Crunches. Visit bigapplecrunch.org to find one near you. Step 1: Register! Let us know how many people you’ll be Crunching with (if you’re not sure, that’s fine - we will follow up with you after Oct. 24). Step 2: Tell your friends! Ask your friends, family, students and co-workers to join you for Big Apple Crunch 2014! Step 3: Get your apples! You can purchase locally grown apples at your local Greenmarket or Youthmarket. You can also place an order with Greenmarket Co. for a bulk delivery and pick up your order at a Youthmarket. Step 4: Crunch! Anytime during the day on October 24th. Don’t forget to take photos and tag #BigAppleCrunch when posting on social media! Crunch Solo: crunch into an apple and take a selfie. Every person counts! Don’t forget to register and hashtag #BigAppleCrunch! Become a Partner: As a partner, we encourage you to spread the word and engage in setting the world record with us by not only hosting your own Crunch but also urging others to do the same via outreach. You will be credited on our website and recognized on social media for your help in furthering the success of this big day! Become a Sponsor: Click here to learn about the benefits of becoming a Big Apple Crunch 2014 sponsor. Read more about Big Apple Crunch Returns October 24th!